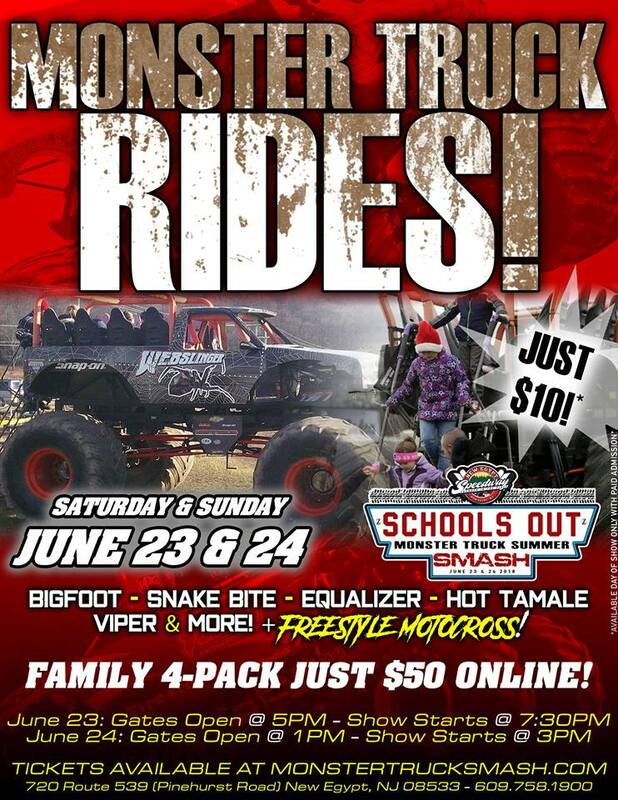 The Monster Truck Racing League Presents the Schools Out Monster Truck Summer Smash at New Egypt Speedway on Saturday and Sunday June 23rd and 24th 2018. See the Monster Truck that started it all, the one, the only, the legend, BIGFOOT along with SNAKE BITE and more along with FREESTYLE MOTOCROSS! 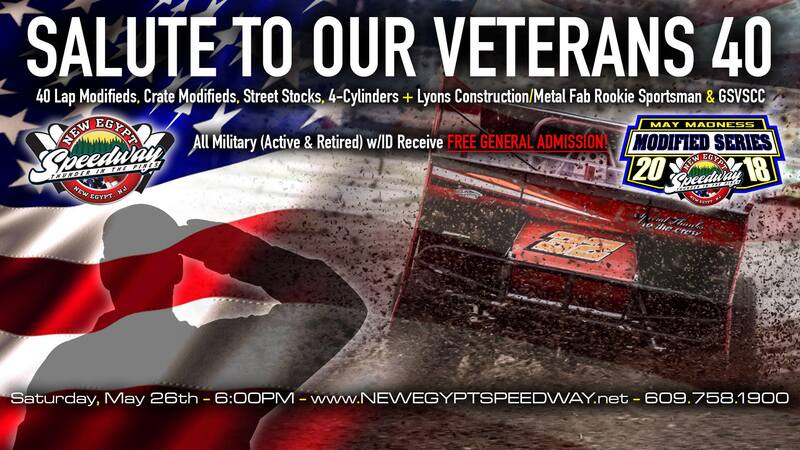 New Egypt, NJ – Following back-to-back rain outs the New Egypt Speedway will be back in action this Saturday Night May 26th with the 2nd Annual Salute To Our Veterans 40 for the Modifieds. Crate Modifieds, Street Stocks, 4-Cylinders & the Lyons Construction/Metal Fab Rookie Sportsman will also be in action this weekend. As a Thank You for their service, all active and retired military w/ID will receive free General Admission this coming Saturday night. This Saturday will also be the “Dirty Dozen” Round of 12 in the JTee’s May Modified Madness Series. Following the tragedy that took place in his hometown of Paramus, NJ last week, Crate Modified driver John Criscione and New Egypt Speedway will be teaming up for a helmet drive to be conducted during intermission on Saturday night. Pit Gates will open at 3PM, Spectator Gates will open at 4PM with Hot-Laps being scheduled for 5PM and Racing beginning at 6PM. Admission to the grandstand is $22 for adults, $20 for seniors 65 and older, $10 for teens 12-15 and Kids 11 & Under are FREE. Pit admission is $30 with a New Egypt Speedway license and $40 with no license. New Egypt, NJ (May 3, 2018) - As has been the tradition for the past four years at New Egypt Speedway, the first Saturday in May signifies the start of the May Madness Modified Series. 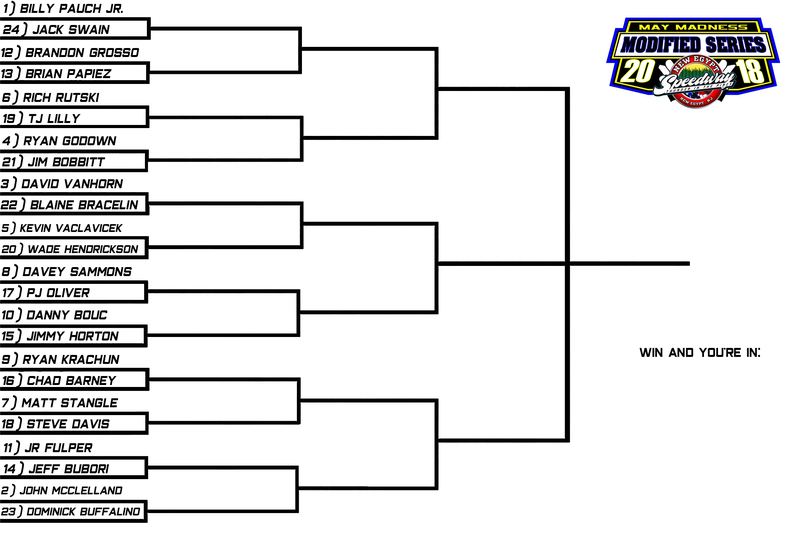 This distinct series features a race within a race as the top-24 drivers in the Modified point standings will compete in a bracket style elimination tournament. The inaugural May Madness Modified Series was won by Ryan Godown in 2014. Billy Pauch, Sr. took home the title in 2015. Dominick Buffalino claimed top honors in 2016 while Danny Bouc was crowned the champion last year. Godown, Buffalino, and Bouc will be seeking their second May Madness Modified Series championship this year. A host of top drivers such as Billy Pauch, Jr., John McClelland, David VanHorn, Rich Rutski, Kevin Vaclavicek, and Davey Sammons will be looking to take the 2018 title. The four race series is set to conclude on Saturday, May 26 with an extra distance 40-lap feature on Salute our Veterans Night. Along with the Modifieds, Larry's Hot Rods & Harley's Northeast Wingless Sprint Cars, Hammer Sportsman, Crate Modifieds, 4-Cylinders and the Lyons Construction/Metal Fab Rookie Sportsman will be in action this Saturday at New Egypt Speedway. 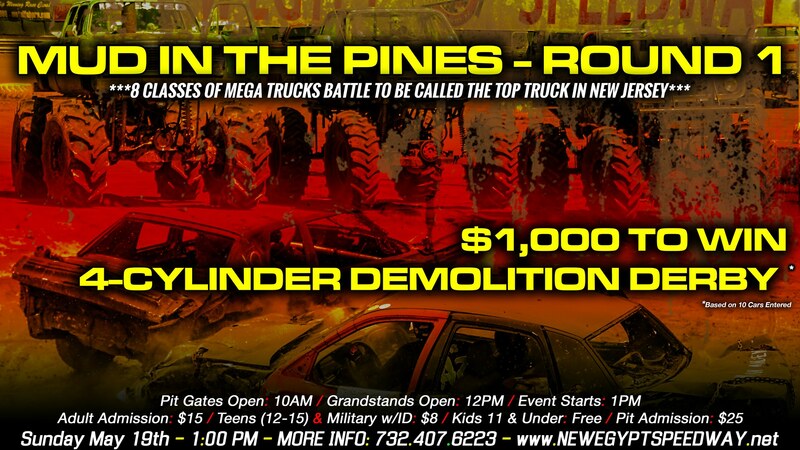 On May 5, competitors may begin to enter the pits at 3:00 p.m. and the grandstand gates open at 4:00 p.m. Hot laps get underway at 5:00 p.m. with racing starting at 6:00 p.m. Admission to the grandstand is $20 for adults, $18 for seniors 65 and older, $10 for teens 12-15, $10 for military personal and their spouses with ID, and Kids 11 & under are FREE. Pit admission is $30 with a New Egypt Speedway license and $40 with no license.